Antipodes map: What’s on the other side of the Earth? 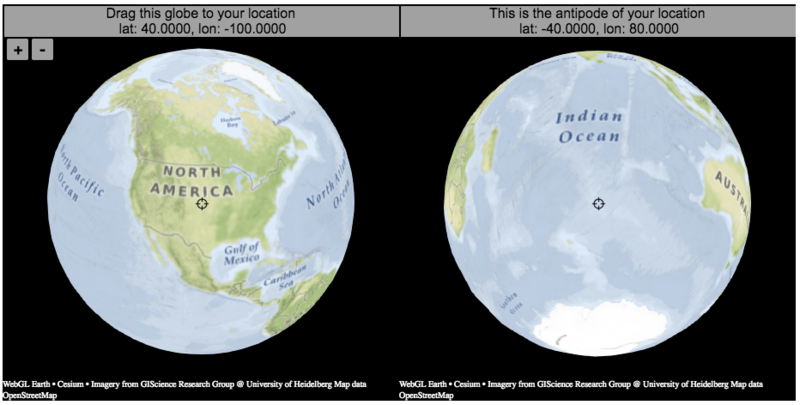 An antipode is a point that is on the exact opposite side of the earth (or other sphere) from a given location. If you drew a line (vector) from your location to the center of the earth and continued that line until it emerged from the other side of the earth’s surface, that point of intersection on the other side is the antipode. When I was a kid, people occasionally mentioned “digging a hole to China”. While this is currently impossible for many reasons1Earth’s core is about 6000 degrees C, China is not the antipode for North America (where I grew up). If you grew up in Argentina or Chile, then maybe that would make a little more sense. The antipodes for most of North America and Europe are in the Indian and South Pacific oceans respectively. It should be relatively explanatory, but you find your location by dragging the globe on the left side so that your location is in the center crosshair. The other globe (on the right) will show you the antipode to your location. You can zoom in and out with the +/- buttons or pinch to zoom on mobile. If you zoom in enough, it will look like a normal two-dimensional web map (like google maps).